I find it truly shocking that in this day and age, hunters are still gunning down polar bears to peddle their skins, teeth, claws and skulls on the international market. If you agree that the world doesn’t have polar bears to spare -- certainly not to end up as rugs -- then please help NRDC end this gruesome trade once and for all. Tell the U.S. 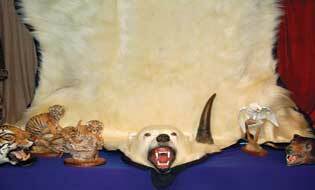 Fish and Wildlife Service to propose a ban on the trafficking of polar bears for profit. TELL THE OBAMA ADMINISTRATION TO HELP SAVE POLAR BEARS! Despite the growing threats of climate change, toxic pollution and oil development that jeopardize the very existence of polar bears, hunters continue to kill hundreds of them every year — and are allowed to sell their body parts legally in the international market.